Be the first to share your favorite memory, photo or story of Janase. This memorial page is dedicated for family, friends and future generations to celebrate the life of their loved one. 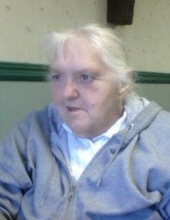 HARTLAND-Janase Marie Rich, 76, died on Monday, March 25, 2019, in Pittsfield. She was born on December 3, 1942, in Burnham, Maine, the daughter of Sherman and Rena (Kenney) Cookson Sr. She graduated from Maine Central Institute with the class of 1959. Janase was a happy person who loved having company visit. She enjoyed watching soap operas, buying scratch tickets, going to BINGO and playing cribbage. She is survived by two daughters: Tina Giles and husband Steven and Bobbi Jo Rich and companion James Bailey; grandchildren: Howard, Michael, Brandi, Brandon and Ashley; great granddaughter, Emily; siblings: Arlene Miles, Sherman Cookson Jr and wife Joyce and Ronald Cookson; and many nieces and nephews. She was predeceased by her husband Robert Rich; and siblings: Joan Sidelinger, Maynard Cookson, Alyson Thomas and Melvin Cookson. The family will receive friends from 11 a.m.-noon, with a service at noon, Saturday, March 30, 2019, at the Shorey-Nichols Funeral Home, 191 Hartland Avenue, Pittsfield, with Pastor Jim Boughman officiating. A committal will be held in the spring at the Pine Grove Cemetery, Route 152, Hartland. To send flowers or a remembrance gift to the family of Janase Marie Rich, please visit our Tribute Store. Guaranteed delivery before Janase's graveside begins. "Email Address" would like to share the life celebration of Janase Marie Rich. Click on the "link" to go to share a favorite memory or leave a condolence message for the family.